Spravedlivaya Pomoshch Fund director, Yelizaveta Glinka (a.k.a. Doctor Liza), who has brought sixteen ailing children and one adult from the Donetsk Region for treatment in Moscow hospitals. For Russia, 2016 was a year dominated by events in Syria, corruption and doping controversies, economic problems, and the continuing standoff with the West. And many of the figures for whom the year will be remembered are linked to these events – some for good reasons, others less so. RBTH has compiled a list of the Russians – both inspirational and controversial – without whom it would be difficult to imagine 2016. 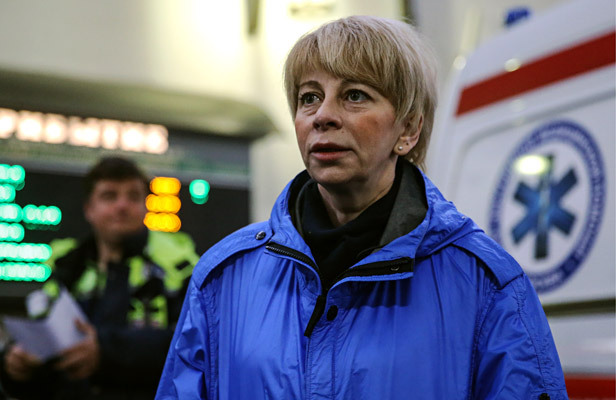 Yelizaveta Glinka, also known as "Doctor Liza," was a doctor and head of the Just Assistance Foundation who was among the 92 victims of the air disaster on Dec. 25 in which a Tu-154 military plane crashed into the Black Sea shortly after taking off from Sochi. Her foundation helps underprivileged people: from the homeless and needy families to those who have suffered as a result of military activity in Syria and in rebel-held territory in the Donbass. At the beginning of December, Glinka received a state prize for outstanding achievement in the field of human rights. According to Glinka, human rights activists and the people they defend are beyond the realm of politics. Immediately after receiving the award she flew to the Donbass, and subsequently embarked on the fatal flight for Syria, where she was to deliver medicine to victims of the civil war there. A cellist and a conductor at the Mariinsky Theater, Sergei Roldugin’s name resonated throughout the world after the publication of the Panama Papers, which revealed that he owns four offshore companies that made deals with Russian state companies. Roldugin is also an old friend of President Vladimir Putin who has preferred to remain in the shadows. After the revelations the musician, along with the Mariinsky Theater Orchestra, performed in the ancient Syrian city of Palmyra after its recapture from Islamic State militants in March and then received the Order of Alexander Nevsky directly from the president "for helping conduct a humanitarian mission abroad." Alexei Ulyukayev, who until the middle of November was Minister of Economic Development, was arrested on Nov. 14 on suspicion of taking a $2-million bribe. According to the investigation, the former minister had asked for money from a Rosneft representative in exchange for a positive ministerial decision on the company's acquisition of a controlling stake in the Bashneft oil company. It is not clear whether the minister's arrest is part of an anti-corruption campaign or a fight against the liberal wing in the government. One thing is clear however: Ulyukayev is the highest-ranking person to be arrested in Russia's contemporary history. In March 2016 Ella Pamfilova became Chairman of the Central Electoral Committee, replacing Vladimir Churov. And while her predecessor was associated with dirty elections, Pamfilova's reputation so far has been practically immaculate. In September Russia held the State Duma Elections, the first for Pamfilova in her new post. But after the elections her work did not end: The Central Electoral Committee is now working on fixing past errors and improving electoral legislation. Journalists note that as a rule Pamfilova personally responds to telephone calls and does not decline to make comments, something that in the Russian political establishment happens very rarely. Vladimir Kuznetsov and Alexei Stolyarov are more famous in Russia under their pseudonyms "Vovan" and "Lexus." Their claim to fame is making telephone pranks on celebrities. For example, Vovan and Lexus once called Elton John, presenting themselves as Vladimir Putin and his press secretary Dmitry Peskov, to speak about LGBT rights in Russia. Other victims include Turkish President Recep Tayyip Erdogan and Ukrainian President Petro Poroshenko. The jokers themselves define their calls as "prank journalism" and say that this method helps them obtain unique information. Yulia Yefimova is a swimmer who represented Russia at the Olympic Games in Rio de Janeiro. The athlete had to fight to participate in the Games through the Court of Arbitration for Sports since the International Swimming Federation did not permit her to compete because of problems with doping two years earlier. The court announced its positive decision on the opening day of the Olympics. Yefimova was booed from the stands and received caustic remarks from her competitors as she walked out to the pool. But all this did not prevent her from winning two silver medals for the 100- and 200-meter breaststroke. Ildar Dadin became the first person in Russia to be convicted of participating in unauthorized protests. But Dadin's real fame arrived after the publication of a letter in which he described in detail the torture of inmates in the Karelia penal colony. In the letter Dadin accuses penitentiary employees of violating the prisoners' rights. Ildar Dadin's letters entered Russia's public discussion on torture in prison. Inspections were carried out in the colony where he is serving his sentence and the Russian mass media began publishing stories about other prisoners. Alexander Prokhorenko was a Russian serviceman who died in the battle for Palmyra in Syria. He had fought in Syria since January as a senior lieutenant, guiding Russian airstrikes onto terrorist locations. In March he found himself in the enemy's rear and, being there for a week, was finally surrounded by ISIS militants. According to the Ministry of Defense’s version of events, Prokhorenko entered into battle with the terrorists but refused to surrender and ordered an airstrike on himself. Besides Prokhorenko, the airstrike also reportedly killed the ISIS militants surrounding him. Prokhorenko's body was flown to Russia and buried with military honors in the cemetery of his native village. He posthumously received the Golden Medal for courage and heroism shown during service and was declared a Hero of the Russian Federation. 9. The Russian hacker – the best in the world? In 2016 Russian hackers became synonymous with internet geopolitical power. It was Russian hackers whom Western politicians and mass media accused of carrying out the year’s most scandalous cyberattacks, in particular the publication of correspondence of the U.S. Democratic Party and the hacking of the World Anti-Doping Agency (WADA). As a result of the first attack, correspondence between employees of the Democratic National Convention, which compromised the party, became public domain. The second hack discovered that WADA had allowed American athletes to use banned drugs for medical reasons – though after legal requests by the athletes. Recently Russian hackers were accused of leaking German intelligence, but this turned out to be a mistake. Four-year-old Bella Devyatkina amazed Russia with her knowledge of six foreign languages: English, French, Spanish, German, Chinese and Arabic. She demonstrated her skills on the TV program Amazing People, and the video with her performance, in which she reads and speaks about herself in several languages, then went viral in Russia. Bella's mother, a linguist and English teacher, has been speaking to her in Russian and English since birth in order to bring up her up bilingual.